A fully furnished, ready-to-move in apartment in the Port Praski. Hamilton May presents a spacious apartment in the prestigious Merlini Residence located by the Warszawianka Water Park. 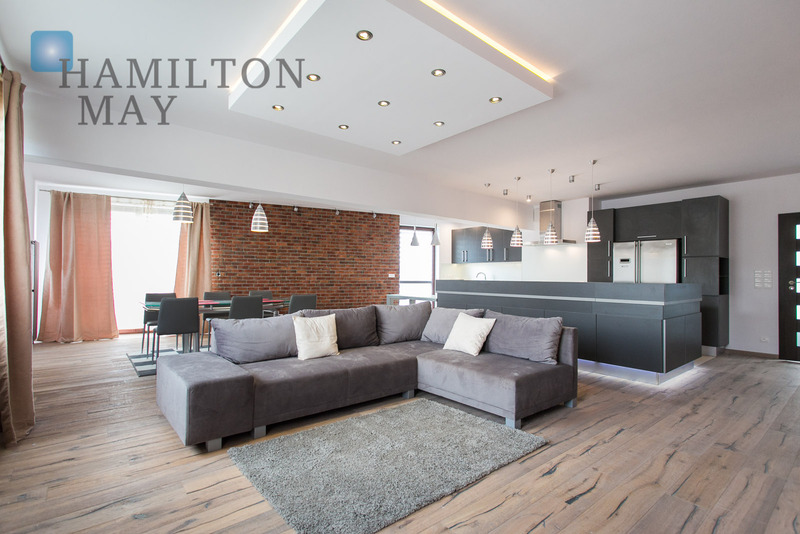 Hamilton May presents a spacious, 3 bedroom apartment in Mokotów - perfect for those looking for a peaceful and comfortable residence. Hamilton May presents a comfortable, three bedroom apartment available for rent in a prestigious location by the Wilanowska subway station. Hamilton May is pleased to present a two bedroom apartment with a separate kitchen in the prestigious Kamienica Ordynacka investment. Hamilton May presents a top floor apartment surrounded by greenery. Three bedroom apartments are generally less popular in Warsaw, as most apartments made for the local market have a smaller configuration. Nevertheless, Hamilton May has responded to demand for three bedroom apartments, mostly from expat tenants, and can source such apartments in various areas of Warsaw. An apartment with three bedrooms is referred to in Polish as a four room apartment. The standard size of a three bedroom apartment in Warsaw is approximately 80-120 square metres, though developers have recently begun offering new apartments in the range of 60-80 square metres with this layout. Some older style block flat apartments will also have three bedrooms, but with an overall compact size and very small room dimensions. Occasionally, larger apartments (often in older tenement buildings an some of the prestigious new investments) will be between in excess of 120 square metres with a three bedroom layout and very large room sizes. Due to the increasing demand for three bedroom apartments available in Warsaw, Hamilton May always has a good selection of such apartments available for rent, despite their relative scarcity. Three bedroom apartments can be rented in all parts of Warsaw, from the city center to the suburbs, and in various standards, from basic to luxurious. The price for three bedroom apartments is determined more by the location and standard of the apartment rather than the size. The average rental prices of high standard three bedroom apartments in the Hamilton May offer are generally around 4000-6000 PLN per month + administration fees and bills. A viable alternative for some tenants in Warsaw is to rent a three bedroom house rather than an apartment, though houses will generally be out in the suburbs and some tenants wish to have an apartment in the city centre within walking distance of amenities and sights. In most modern developments, tenants of three bedroom apartments will also be able to rent at least one protected parking space with their apartment.